I have always had problems writing about myself, so please bear with me. 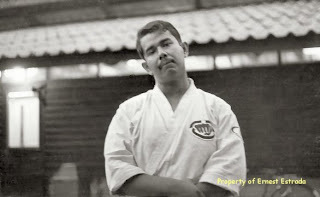 I began training in Okinawan karate-do at the local YMCA in 1960 (Matsumura Seito Karatedoh Shorinryu). In 1963 I joined the US Military and served in Japan and Okinawa. Later, in 1970, I was re-assigned to Washington, DC, and worked as a translator at the Pentagon for two and one half years. In 1972 I was promoted to shihan by the Zen Nippon Karatedoh Renmei (All Japan Karatedoh Federation) in Okinawa Seito Karatedoh (Toyama-ryu). In 1973 I was also promoted to shihan by Nakazato Shugoro Sensei in Okinawa Shorinryu Karatedo (Chibana-ha). I have been an active teacher of Chibana-ha Shorinryu since 1970 and have taught in Mexico, England, Germany, Spain, Ethiopia and Canada. Presently I teach Chibana-ha Shorinryu in Michigan. Professionally, I am a retired Probation Officer (31 years) and now work part time as a Probate Court Fiduciary. Over a period of 45 years I have researched Okinawan-style karatedoh and have interviewed a wide assortment of well known Okinawan karate teachers (shorinryu, gojuryu and uechiryu). I have authored numerous articles for a variety of martial arts publications and a series of 15 booklets based on my research. Although I am retired from the Circuit Court and only work part-time as a Fiduciary, I find myself more busy than ever. Presently I am reviewing and re-editing my interviews and I hope to have them up on this site by the end of the year. I am scanning some 3300 pictures that I took in Japan and Okinawa. Further, the little woman keeps me busy with ballroom dancing and grilling for friends and family. I try to get out to the gun range several times a month to play with my Tango-3 and my sig - I also enjoy re-building rifles. Watch out - I am planning on switching over from police combat shooting to Cowboy Action Shooting! I study photography, coin collecting (ancient Roman and Greek coins), collecting WW2 sake jars and cups and the practice of Chibana-ha karatedoh and Okinawan-style kobudoh. Copyright ⓒ 2011 Ernest Estrada. All Rights Reserved.